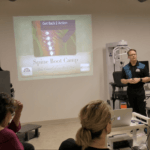 What is Spine Boot Camp? Dr. Gord McMorland and the team at National Spine Care have created a unique program that focuses on spine care education and exercise, all in a classroom/workshop setting. Knowledge is Power! 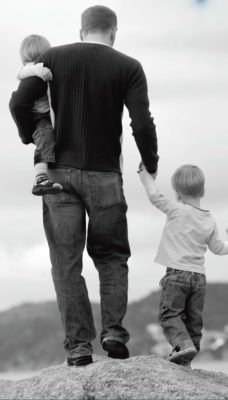 In this course you will learn how to get yourself our of pain and regain your quality of life. This is not just an exercise class! Our Spine 101 approach gives you the back facts to be able to spare your spine as you resume your normal activities in a safe, controlled fashion. We start your Spine Boot Camp education with Level One. Small One Hour per Week supervised classes run for six weeks and focus on Spine 101 education including instructions and exercise guidance. Who is Spine Boot Camp for? This course is for anyone who wants to free themselves from the shackles of low back pain and sciatica. You may be asking why you should consider this course over the multitude of other books and video self-help back pain approaches? Back pain is now generally considered a 20th and 21st-century medical disaster. Significant advances in knowledge, technology and treatment solutions have certainly not solved the problem. There is even some suspicion that the health care community may have made things worse. We’re not talking about serious spinal diseases and major neurologic problems. We now have diagnostic procedures and interventions that can help there. The challenge is that almost all of us experience low back pain at some point in our adult life. A great many of us experience this over and over again, despite going for treatment ad infinitum. All of this is put together over a six week period of time designed to give you back control to regain your quality of life! Hear What Our Patients Are Saying About This Course! Dr. Gord, thanks for putting this adventure on. It has clarified the importance of Core and given me some comfort that if I follow your program I might continue to enjoy the various activities that I have up until now had to be very cautious about. Thanks for the help! My experience with the course was fantastic. It was very informative but not overwhelming with the technical details. I notice how much more aware I am with my daily tasks and how to properly bend to pick up things, etc. I’ve recommended this class to a couple friends already and they are signed up for the next session. Thanks Dr. Gord, for taking the time with your patients and having patience ;). Best chiropractor in town! Spine Boot Camp completely changed my thinking and approach to my back injury, and it gave me hope for recovery after feeling like giving up. I learned a lot about back injuries and the body’s response, and how to relieve pain myself. 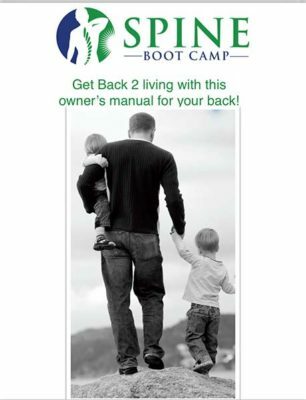 Call us at (403) 270-7252 to register for the next Spine Boot Camp today!